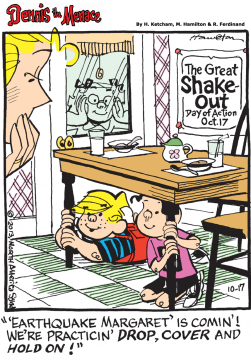 Dennis the Menace, the beloved comic panel about a mischievous little boy with a penchant for causing upheaval wherever he goes, will help raise awareness of Great ShakeOut Earthquake Drills. In a special panel running in newspapers nationwide and online on Oct. 17, the comic will draw attention to the largest preparedness event in world history. Millions of people will practice how to Drop, Cover, and Hold On at 10:17 A.M. today. Participating is a great way for any family or organization to be prepared to survive and recover quickly from big earthquakes – wherever they may live, work, or travel. To participate in Great ShakeOut Earthquake Drills, go to www.ShakeOut.org/california/register and pledge a family, school, business, or organization’s participation in the drill. Registered participants will receive information on how to plan a drill and how to create a dialogue with others about earthquake preparedness. All organizers ask is that participants register (so they can be counted and receive communications), and at the minimum practice “drop, cover, and hold on” at the specified time. It is only a five-minute commitment for something that can save your life. It all begins with registering, which is free and open to everyone. For more information, visit www.ShakeOut.org/california. In a similar effort last month, Dennis the Menace helped raise awareness of National Preparedness Month with a special Sunday strip on Sept. 1, 2013 that ran in newspapers nationwide and online. Each Great ShakeOut region is locally managed by a partnership of emergency management, earthquake scientists, community leaders, private sector organizations, and many other partners (listed on each region’s website under the “Partners & Sponsors” tab). The Southern California Earthquake Center (SCEC) at the University of Southern California coordinates and assists all regions and manages the www.ShakeOut.org website with support from the Federal Emergency Management Agency, National Science Foundation, U.S. Geological Survey, and other sponsors. Distributed by King Features Syndicate, Dennis the Menace is published in more than 1,000 newspapers in 48 countries and 19 languages and is viewed by more than one million readers per month on more than 200 websites.